If there is one gift I could give to all new parents, it would be the ability to make their baby fall right asleep on command. But since my super powers were never really strong in that area, I’ll have to settle with telling you about a cool free app that might help make bedtime come quicker. Even for those kids who have long passed the age of being rocked to sleep. 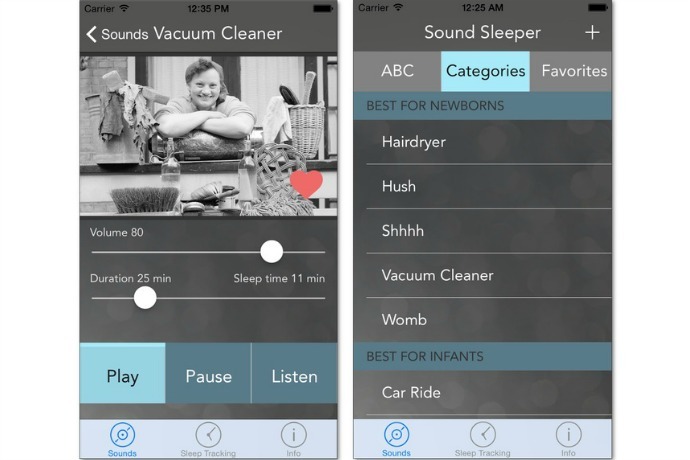 In honor of Father’s Day, I present you with the Sound Sleeper app for iOS and Android. This white-noise app has a clean retro-design created for (tired) parents by fellow parents Michael and Miriam Feigenson. The basic free version offers 30 minutes of continual white noise playing in the background, so there’s plenty of time to usher your little one off to slumber land. And when in “listen” mode, the app will even start up if your baby starts to fuss during that time. 16 baby-friendly sounds sorted by age include a vacuum cleaner and womb sounds for newborns, and even that shhhhhh sound that we parents can do so well. For babies and toddlers, choose from a wall fan, the putter of a car ride, seashore sounds or a busy market. Hey, there’s even options like a crackling fireplace or babbling brook should you need help falling asleep yourself. Not sure how often new parents have trouble with that, but it could happen. Sound Sleeper app for iOS and Android plays 30 minutes of white noise for free. In-app purchases are available for unlimited sound duration, all night-sleep tracking data, or an extra-long fade out for babies who need the sound to gradually grow quieter.